Is Tom Brady really the Super Bowl king? Tom Brady might be the most successful player still active in the NFL with five Super Bowl rings but it’s just too easy to give him the title of ‘greatest of all time’. After all, there are a number of quarterbacks throughout the history of the sport that has had a massive impact on their respective teams. Are any of them able to match the Patriots’ greatest though? Statistics can prove anything; 99% of people know that. But take a serious look at the numbers and there are a couple of household names that can match Brady and, in some cases, even better him on the field. Peyton Manning is the first player that comes to mind – he’s won five league MVP awards compared to the two that Brady currently has. He’s also the all-time NFL leader in yards (71,940) and touchdowns (539). Compared to Brady, who has 66,159 yards and 488 touchdowns, it’s an impressive record, but the former Colts and Broncos quarterback has only got two rings, which he won in 2006 with Indianapolis and in 2015 with Denver. Manning also holds the record for most touchdowns thrown in a single season, with a remarkable 55 achieved in 2013; that beat Brady’s effort of 50 thrown in 2007. 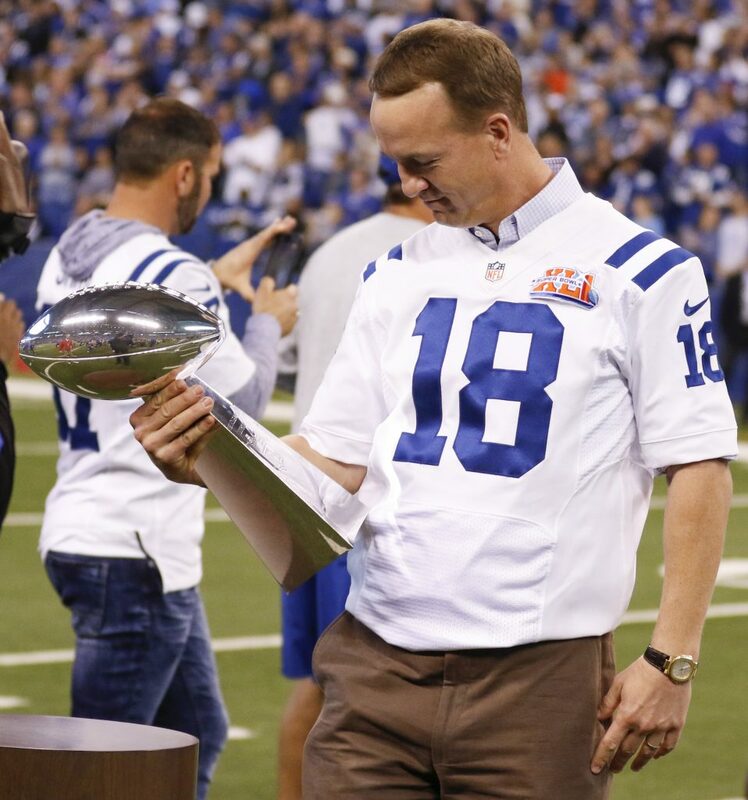 Manning also holds the record for most touchdowns thrown in a single season, with a remarkable 55 achieved in 2013. Of course, Brady has better postseason figures than Manning, with 10,226 yards and 71 touchdowns, which went a long way to sealing those five Championship victories. Brady’s consistency is one of the reasons the Patriots are perennial favourites in the AFC Conference stakes today. Others that should be considered but who haven’t matched Brady in Super Bowl wins are the quarterback pair from Green Bay. Brett Favre was one of the most successful quarterbacks in the NFL. His longevity and command were inspiring, making him a legend of the sport – especially in Packers’ history. His numbers are incredible too, throwing 71,838 yards for 508 touchdowns in an NFL career that spanned two decades. It is amazing then that he only won one Super Bowl in that time, leading Green Bay to a 35-21 victory over the Patriots in Super Bowl XXXI in 1997. The other Packers great that many would suggest is a better player than Brady is Alan Rodgers. He hasn’t played the same number of games as the Patriots’ hero but boasts some outstanding numbers with 313 touchdowns and the league’s lowest career passing interception percentage for quarterbacks during the regular season at 1.6 percent. His only Super Bowl win came in 2010 but injuries have taken their toll. He missed a large chunk of the 2017 season after breaking his collarbone. That same injury ended his 2013 season, and the Packers failed to make the playoffs. A healthy Rodgers is key to any success and determines the length of the Packers’ odds for the Super Bowl. Only one person had five Super Bowl rings before Brady matched this and that was Pro Football Hall of Famer Charles Haley. The versatile defensive player won two rings with the San Francisco 49ers and three with the Dallas Cowboys. No quarterback has ever won five rings but Terry Bradshaw won four in his time with the famous Steelers side of the 1970s. They were the first side to be given the ‘dynasty’ tag and won all four of their Super Bowl appearances between 1975 and 1980, with Bradshaw leading the team in all of them. While Bradshaw’s numbers are nowhere near as good as Brady’s, he played in a different era of the game. Other quarterbacks that deserve a mention are Jon Elway and Joe Montana but, in terms of the Super Bowl, there is only one king and that is Brady.